Theresa E. McCormick, Ed.D. is Professor Emeritus of Curriculum and Instruction at Iowa State University. This designation recognizes her many contributions to the academic life of the community of scholars. She served as professor of education at Iowa State University from 1984 to 2004, teaching, conducting research, and publishing in the fields of multicultural and gender studies. She taught art and multicultural education for 11 years in the West Virginia public schools. Dr. McCormick is the author of “Creating the Nonsexist Classroom: A Multicultural Approach,” co-author of “Multicultural Education: Awareness and Activities,” and author of 28 refereed journal articles. As Professor Emeritus, she contributes to her professional associations, American Educational Research Association and Research on Women and Education; makes invited professional presentations; and contributes her work to edited books. Currently, she is an active artist and non-fiction writer. Her art work ranges from abstract to expressionistic to realist, and is rendered with a variety of media, including watercolor, oil, acrylic, and mixed media. In addition to paintings, Theresa exhibits her fabric wall hangings, collages, and serigraphs (silkscreen prints). She has shown her art in various university galleries and community centers across the United States, and is currently exhibiting in the Seattle area. 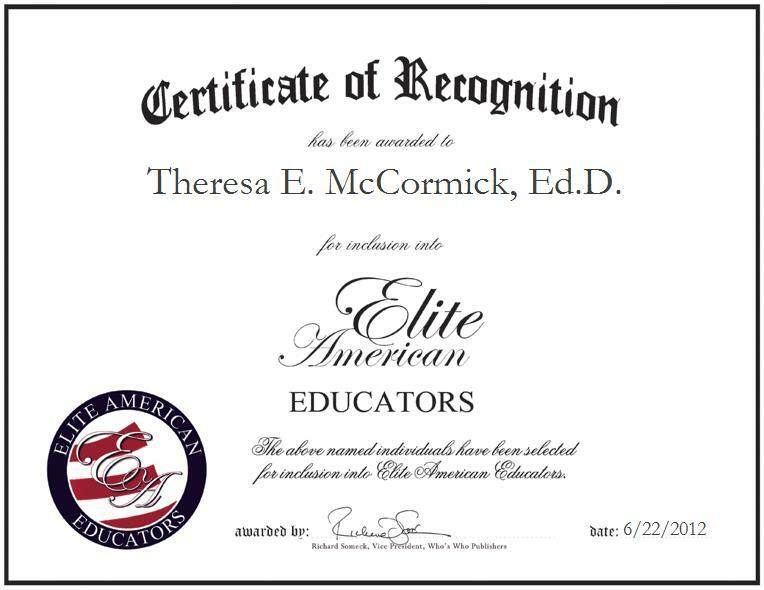 Contact Theresa E. McCormick, Ed.D.